Connect to your server using FileZilla. 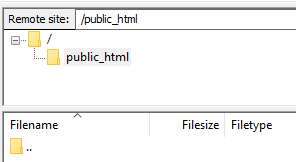 You will see your server's files listed in the top Remote site window, locate the folder you want to upload your file to. Drag and drop the file you want to upload into the folder you just located. The file will upload immediately, and you will then see it inside the folder. Your file is now uploaded.